This is important! Please read carefully! 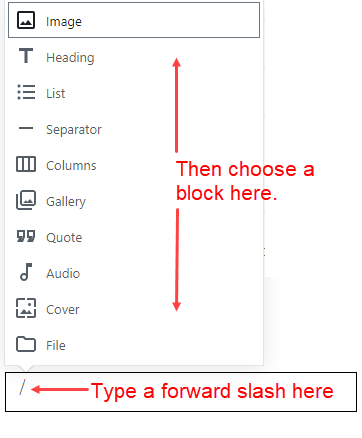 Access commonly used blocks by typing a forward slash as the first character in the block editor. To choose a block type, type a forward slash as the first character in the new block box. WordPress watches which blocks you use the most and adds those blocks to the common blocks panel. For instance, you might use the button block regularly. If you do, button will be added to the common blocks. Now you will see button as one of the options, when you type a forward slash as the first character in the new block editor. How do I access the many other blocks that are available? Move your cursor to the left of the new block pane and click the plus icon. Move your cursor to the left, when the plus icon appears, click it. After clicking the plus icon, drill down to find the block you need. When you select a block, a toolbar appears above that specific block. 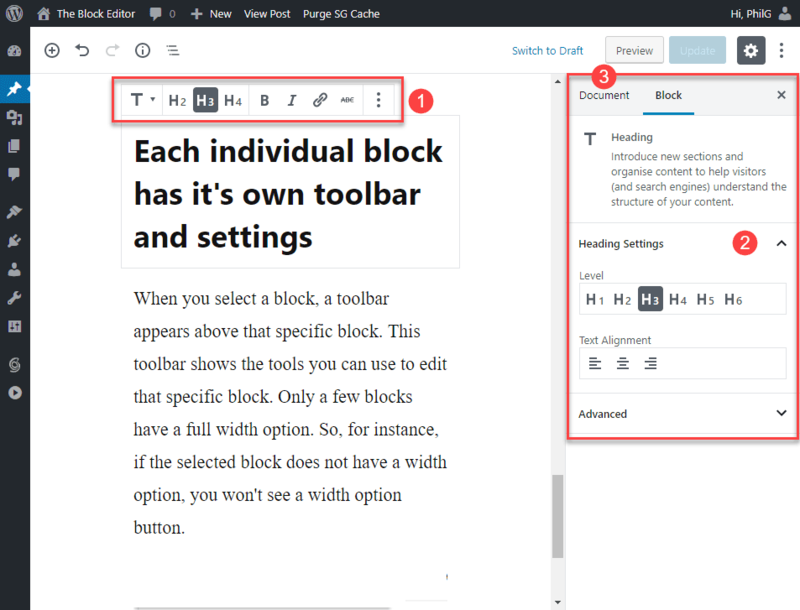 This toolbar shows the tools you can use to edit that specific block. Only a few blocks have a full width option. So, for instance, if the selected block does not have a width option, you won’t see a width option button. This is the toolbar for the paragraph block. 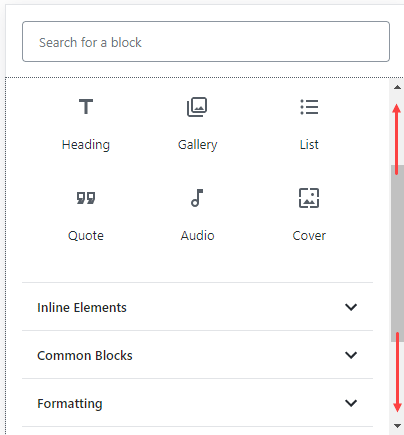 Block settings in the post editor sidebar. There are two tabs in the sidebar. Toggle between the document tab and the block tab to see both settings. Click the arrows to expand each setting. Settings for the whole document. 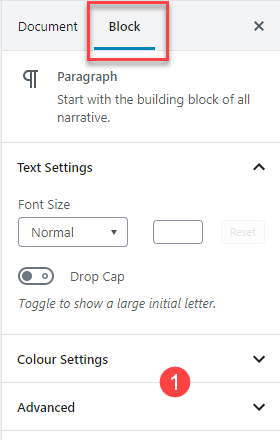 Settings for the paragraph block. Plus icon above a row adds a new block on it’s own row. Plus icon to the left opens a dialogue that enables you to select the type of block to use. It does not add a new block. In column based layouts you will see a plus icon to the right. This opens the block selection dialogue that enables you to select the type of block to use. It does not add a new block. And remember, the easiest way to select common blocks is to type a / forward slash as the first character in the dialogue box. This opens a list of commonly used blocks for you to choose from. Make sure you master these basic skills before moving on to more advanced block editing. The new block editor is very powerful. Theme authors and plugin authors are already adding beautiful looking, ready made blocks to their themes and plugins. All kinds of blocks are already available via plugins. For instance Atomic Blocks plugin includes a great looking call-out box block and a very useful post grid block. Once you’ve mastered the basics of how blocks work, dealing with individual blocks is much easier.